I think I've been pretty good this time round! 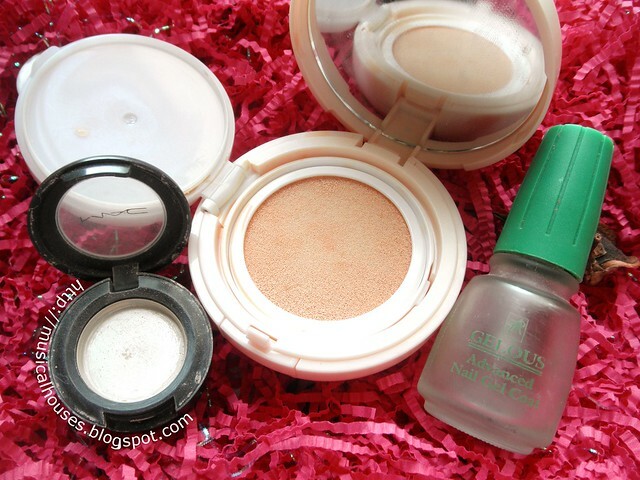 I've actually used up a whole lot of stuff with this round of empties! There are 6 products in here, so perhaps numbers-wise this isn't the most, but 3 of them are tubs of moisturizers, so I get some credit, right? As an aside, though, I've always felt like the "empties" post is perhaps something only the beauty junkie can appreciate. I mean, normal people with like, 3 eyeshadows and 1 blush and 1 powder foundation and 2 lipglosses don't go around telling people, "O Hai I finished up my eyeshadow! So happy! Squeeee!" because they pretty routinely use up their stuff - and go back to get the same (or similar stuff). So to them, it isn't particularly spectacular when they use up something. But the beauty junkie is slightly different. When you have literally have a few tens of blushes, eyeshadows, lipglosses, and so on, even as you keep lemming the new collections and makeup that gets put out, then every empty that you use up, every pan you hit, becomes a cause for celebration. To me, it's sort of a way of saying any one of the three messages: "Look, I actually use up my stuff - see, I don't have that much stuff, you're kidding, stuff, who me? ", or "Look, I actually use up stuff! I get to buy more! ", or "Look, I used up this stuff, because it's awesome/although it sucked, and I want to tell you about it!" And hence, the empties post. Look at all those empties! This is some serious using up of products, guys! But don't let my existentialist comments on empties bother you, let's get down to the good stuff - what did I use up this time, and what do I think of it? Since skincare is predominant in this round of empties, let's talk about that first. I have three (yes, three!) 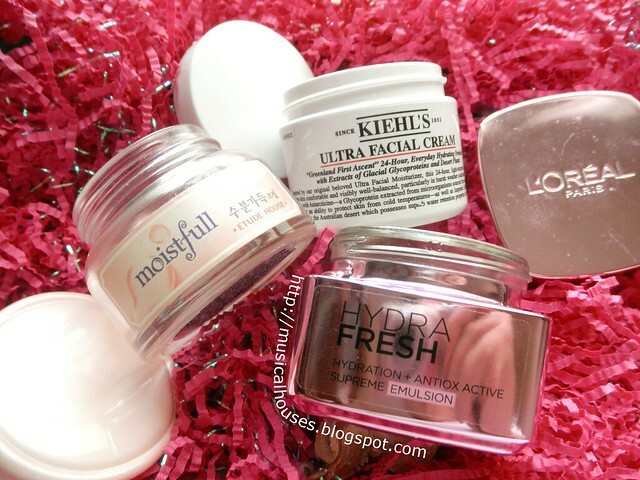 tubs of moisturizers: the Kiehl's Ultra Facial Cream (which I've reviewed before), the L'Oreal Paris HydraFresh Supreme Emulsion (also reviewed before), and the Etude House Moistfull Cream (in special packaging, because this was part of a Moistfull Cream set). I know it might seem a bit strange to use up 3 jars of moisturizers all at one shot, so I think I should explain a little why there are suddenly so many moisturizers showing up. I actually was nearly finished (like just a few dollops left) with my Kiehl's Ultra Facial Cream at the time of my last empties post some months back, so it just rolled over into this post. And while I've used it up sometime ago, I think I like it quite a lot - it's slightly heavy-textured compared to some of the more lightweight creams (e.g. those from Japanese brands) so it's probably best for drier skin, but I find it a really good product for me too since I sit in an air-conditioned room most of the day at work. It doesn't break me out or have strange interactions with my sunscreen or other skincare products (no balling, etc.) which is always a plus. At the end of the day, I think what I said in my original Kiehl's Ultra Facial Cream review still stands - I liked it then and I still like it, and I still think it's a good solid, all-around moisturizer. I'd definitely use this again. The L'Oreal Paris HydraFresh Supreme Emulsion was the next moisturizer I used after the Kiehl's one - it so happened that the weather was hot, and I was trying out something different. Again, I think my opinion, which I've previously shared in my L'Oreal Paris HydraFresh Supreme Emulsion review from before also hasn't changed - this is a light moisturizer that sinks in fast, and in that respect, it's great for hot, humid climates or summers, but don't expect it to be very moisturizing if you have dry skin or in winter. In my case, I found it worked fine as a nice, easy to use, basic moisturizer in warmer weather. The last empty I have, the Etude House Moistfull Jelly Essence, well, actually is an empty my sister used up. You might remember this little jar of Moistfull Cream from this haul post sometime back, which I bought when it was on sale. I didn't like the Moistfull Cream that much, to be honest, so I passed it on to my sister, and she used it up, although she was kinda "meh" on it too. I know other bloggers have raved about it, but for me, I just found it kind of silicone-y feeling, and in general I don't like my face products to feel too silicone-y. I mean, I know silicones are commonplace, and I'm actually cool with them, and have reviewed products with silicones positively. I just don't like it when the entire product starts feeling a bit too silicone-like, because then it makes me feel like I'm applying a bunch of silicone and not much else on my face. My sister (who has much less tolerance for anything feeling heavy or sticky) felt that it was sticky, but she admits that it did in fact moisturize her skin, and she had less dry-skin issues while using it. So there you go - at the end of the day it still moisturizes, I guess. So much for the skincare. Now let's move on to the other stuff - makeup and nails! I've used up a MAC Eyeshadow in Vanilla, the Etude House Magic Any Cushion in Magic Peach (which I've reviewed and swatched here, and also wrote about here), and a Gelous Nail Gel Coat. I used up another MAC Eyeshadow! Yes I did! I've never actually blogged about MAC Vanilla because it just seemed so boring, but it's in quite a few of my FOTDs. You probably can't see it in action though, because I use MAC Vanilla as a base, so it's not really visible on my lid like say, a smokey teal shadow would be. But oh, MAC Vanilla was such a good base - it is well pigmented and smooth, and had a nice matte finish with no strange glitter. This is definitely a staple in my colour wardrobe, and if I wear makeup, chances are I would reach for this, or a similar colour. Even if I wear this and nothing else, it just makes my eyes look a bit better because it brightens up the lid area. The Etude House Magic Any Cushion is a pretty popular product, which is expected given the popularity of BB cushions nowadays. As compared to other BB cushions on the market, the Etude House Magic Any Cushion is actually quite sheer - it doesn't cover much, but it adds a sheer wash of colour and glow, which you can either use as a base, or else, as some sort of brightening primer. There isn't much product in there because the sponge takes up much of the space, so if you use this everyday, and if you have a large face like me, you can use this up in a few months. Magic Peach was my favourite and the most wearable of all the shades, so it's no surprise it was the first to get used up. Lastly, the Gelous Nail Gel Coat. This is my favourite-st base coat ever - probably only tied with my other love, the Sally Hansen Nail Quencher Hydrating Base Coat (which was discontinued sometime in 2009/2010/2011, much to the anguish of the Nail Board community on Makeupalley at the time - I was lucky enough to get some backups, but I'm not expecting them to last forever). Anyway, this is pretty great stuff - my manis last for a decent time with this on (maybe 4-5 days where the colour is still looking good, which is good for me), and it has a nice, ridge-covering effect on your nails. Of course, I have multiple bottles of Gelous, so I'm not too worried that I used this up - I've already opened the next bottle as of this post! So there you have it - my quick-and-dirty reviews and thoughts on the stuff I've used up! I think all in all this was a pretty good batch of empties, because most of the stuff I used up, I liked. What are you guys using and loving right now? Let me know! I really wanted to try the Etude House Moistful Cream, but I'm having second thoughts after reading how siliconey it feels. I think I'd get one withe the Kiehl's one though - I like a good, no-nonsense, bare-bones moisturiser that does its job! I hardly ever finish makeup except foundation and mascara, but I've hit pan on my ELF brow kit and I'm kind of excited about it haha. I do love empties posts, writing AND reading them. @Xev K: I got it while I was in the UK from Sally's Beauty Supply! It's quite hard to get outside of the USA/UK sadly! And I agree, it's not worth paying $$$$ shipping for. Sorry I can't be of more help, I wish there was somewhere online I could buy this too! Where did you buy the gelous nail gel base coat? I've been searching for it for a long time! @Xev K: I replied to your comment above! And don't worry about the double comment, it's OK.